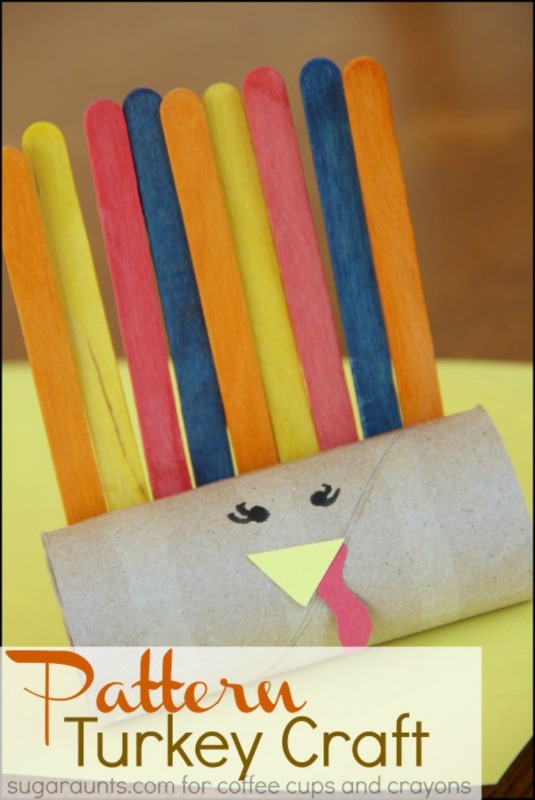 This time of year, we love to create fun turkey crafts! Besides being cute, they are fun to make. When a little learning is mixed into the crafting, the kids have fun and don’t even realize they are learning skills and concepts. We made these paper roll turkeys with pattern feathers and worked on color identification with the younger kids and complex patterns with the Kindergarten-aged kids. Start by laying out the colored craft sticks. Talk with the kids about the color names. 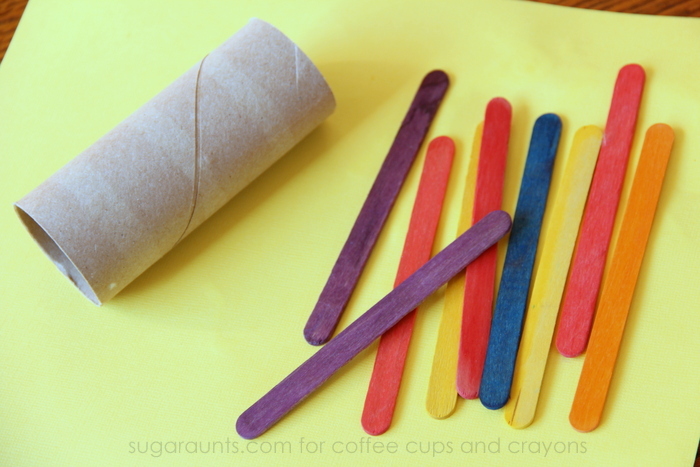 This is a great task for Toddlers or Preschool-aged kids. Younger brothers and sisters love to answer questions during a learning project where older kids are involved! My Toddler (age 3) identified the colors with help, but by the end of the craft, she was getting better at color identification. Lay out the craft sticks into a pattern that you would like to make on your turkey. We went with an A, B, C, D pattern with our feathers. My Pre-K son (age 5) loves patterns, so he thought this was a pretty fun craft to whip up. 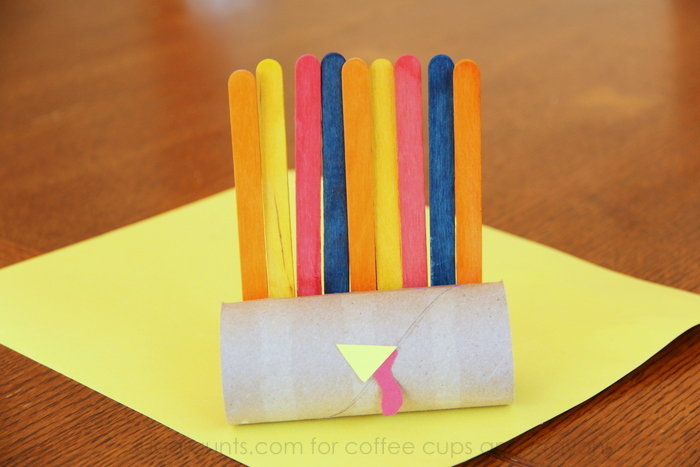 Use tape on the back of the paper roll. We taped our pattern into place with scotch tape and used an extra craft stick to make a “kick stand” to hold the turkey up. Tape one craft stick lower than the others to keep the turkey from rolling over. Cut a triangle from the yellow construction paper and a red gobbler for the turkey. Glue these pieces into place. Finish up with a cute set of eyes. You could also glue on googly eyes, but we went with a happy little turkey with eyelashes. He’s ready to be a centerpiece on the Thanksgiving table! For even more turkey and Thanksgiving fun follow our Thanksgiving Pinterest board! 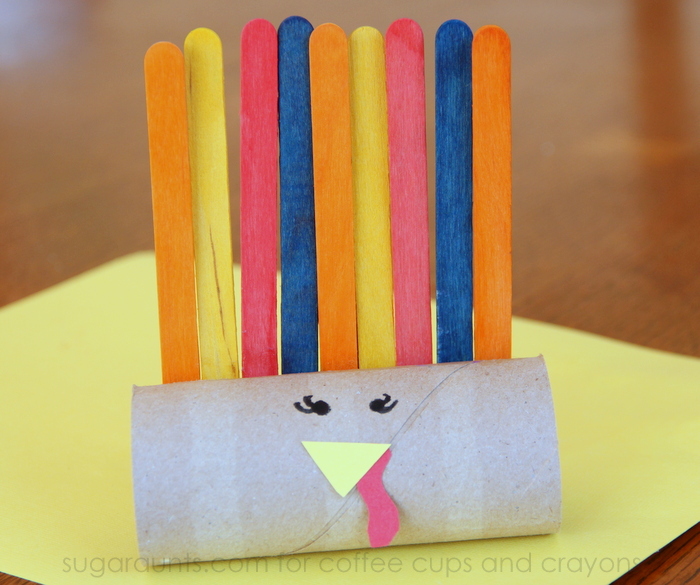 Follow Megan Sheakoski ::Coffee Cups and Crayons’s board Thanksgiving on Pinterest.